Armenia is the most ethnically homogeneous of all the post-Soviet states. But it has become a pioneer in the Caucasus by being the first country in the region to offer guaranteed parliamentary representation to its minority communities. Following April’s elections, Armenia now has four ethnic minority MPs – one each from the country’s Yezidi, Assyrian, Kurdish, and Russian communities – in its 105-seat parliament. But the process by which they were elected, which required them to ally with one of Armenia’s existing political parties, raises doubts about the extent to which they can effectively represent minority interests. The four new minority deputies are: Arsen Mikhaylov, the long-time president of the Assyrian community organization “Atour”; Yezidi representative Rustam Makhmudyan; the Kurdish community leader Knyaz Hasanov; and Tatyana Mikaelyan, a former bank manager born in Tatarstan, representing the Russian community. Hasanov even chaired the new parliament’s inaugural session under a tradition giving the oldest member that honor. They were chosen under a provision in the new constitution, adopted in 2015, that sets aside four seats in parliament for minority representatives nominated by parties. Three of the new deputies represent the governing Republican Party of Armenia (RPA), and Mikaelyan the Prosperous Armenia bloc of oligarch Gagik Tsarukyan. 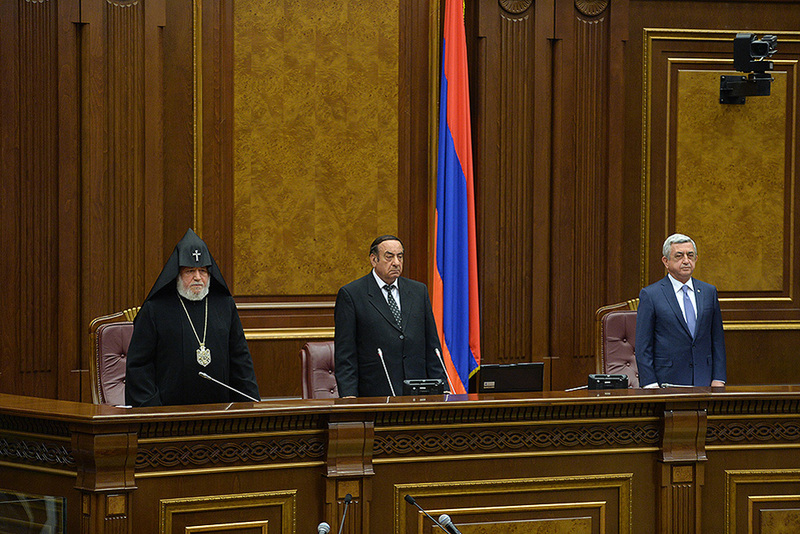 Prior to this year, Armenia had only ever had two non-Armenian MPs: the current speaker of parliament, Edik Sharmazanov, is of Pontic Greek descent and an ethnic Georgian, Nana Togoshvili, served in the 1990s. The four minorities represent tiny portions of Armenia’s official population of slightly over 3 million. According to the 2011 census, the Yezidis number about 35,000; Russians about 12,000; Assyrians about 3,000; and Kurds 2,000. Throughout the Soviet period, Azeris comprised Armenia’s largest ethnic minority, with over 160,000 members, according to the 1979 census. But the overwhelming majority fled the country between 1988 and 1991, amid the outbreak of the conflict over Nagorno-Karabakh. Minority groups today have varying political agendas. Russians are mainly urban, and for the most part, are integrated into Armenian society. Yezidis, by contrast, are more isolated and often semi-nomadic, creating challenges in education. The Yezidis and Assyrians also have sought to call attention to the plight of their co-ethnics, who are among the most vulnerable victims in the wars in Iraq and Syria. Makhmudyan has said that one of his priorities is to officially recognize the massacres of Yezidis in the Middle East as genocide. The question of representation aside, it is a common phenomenon that small minorities in Armenia side with governing parties, believing that such affiliation is the easiest and safest way to protect their interests. Meanwhile, some analysts contend that the numbers of Armenia’s minorities are too small to have tangible electoral clout independent of existing parties. The electoral threshold to gain representation in parliament is 5 percent, or about 100,000 voters – far higher than the combined total of all Armenia’s ethnic minorities, noted director of the Yerevan-based Caucasus Institute Alexander Iskandaryan. “Without some quota, there’s very little chance that any minority deputy would enter parliament,” he said. No other Caucasus country has ethnic quotas for parliament. Georgia, the most ethnically mixed of the three countries in the South Caucasus, now has its most diverse parliament: with 11 out of 150 seats held by ethnic minorities, including Armenians, Azeris, Ossetians, Abkhaz, and Yezidis. Azerbaijan has a handful of MPs representing the Talysh and Lezgin communities, as well as an informal practice of always having at least one Russian and one Jewish member of parliament. The separatist entity of Abkhazia is one of the most ethnically diverse parts of the Caucasus, but ethnic Abkhaz – by most counts a minority in the territory – dominate its government. Currently, the de facto 35-member parliament has only three minorities, all Armenians, under an informal “gentleman’s agreement,” whereby parties nominate minority candidates in districts where they predominate. Maxim Edwards is a writer and commissioning editor at openDemocracy Russia (oDR).